Last week, about 1700 people attended Paris Europlace International Financial Forum. We’ve used NamSor API to figure out the attendants’ likely international profiles and found the audience to be very diverse. 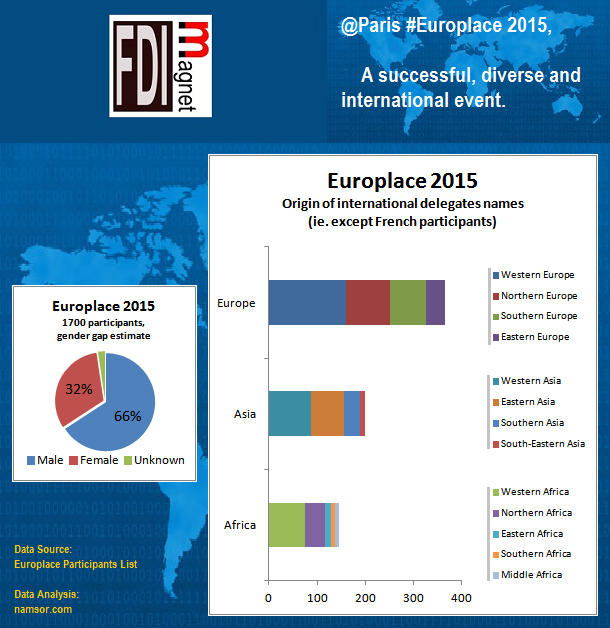 Diverse panels invited by the organisers to reflect the international orientation of the Paris Financial Center (although there is still a gender gap: ~25% women speakers) but also to pave the way for COP21, one the largest high-profile international conference to take place in Paris in December 2015. To be noted: very few attendants / speakers from Greece or Iran, both countries that made the headlines in the following days. Greece (and the Greeks) were also absent of the OECD Forum earlier this year, as if the World had given up on Greek economists/politicians/business people taking control of their country’s destiny – and having failed to engage the Greek Diaspora too. As for Iran, yesterday’s historic deal means – if it goes all the way to getting the sanctions lifted- that we’re likely to see more Persian names in international forums that will be organized in 2016. Who is curious to discover who are the top Iranian economists today, the names you’re likely to see on panels of economic conferences tomorrow?